The HLYWD Migratory Anagram proposal is an art project by Jeffrey Inaba and Darien Williams. 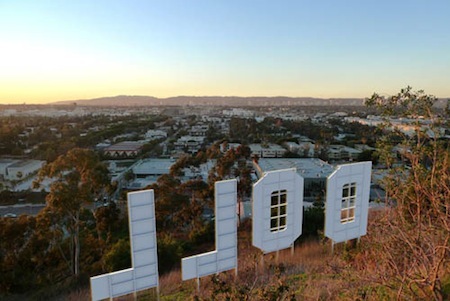 They have a simple suggestion for the Hollywood sign. Proposal: Let it roam? The sign’s simple structure and generic materiality lend it well to temporary erection on any number of sites throughout the city. Neighborhoods ‘borrow’ the sign or any subgroup of its letters for a determined period of time. Migration affords the sign a temporal dimension, which ensures its continued vitality as an unplanned landmark. I'm reminded of sf writer Alan Nelson's 1953 story Soap Opera. In the novel, an ad company executive was displeased with standard sky writing; he wanted something that would last longer. Employee Everett Mordecai had the answer.